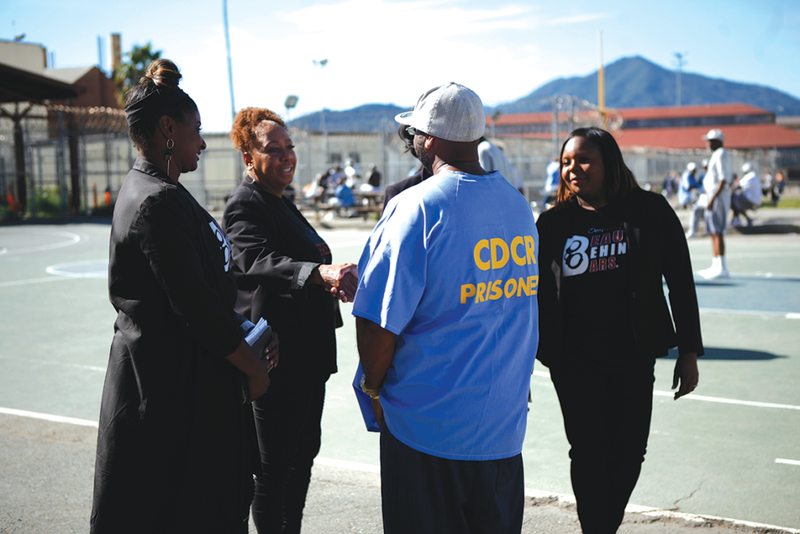 An all-women’s organization, aimed at inspiring incarcerated people to overcome their despair and anger, visited San Quentin on Nov. 3 for the second time in two years. Her presentation gave the incarcerated men a perspective on how some actions and some consequences may shape the generations to come. “Something Mrs. Tiffany Love said about children, who grew up with adult issues, grow up to be adults with childhood issues they never forgot,” said Steven Bustamante, an incarcerated man in the audience. Kamaria Payne, Dr. Sareya Byrd McKinney and Rhonda Brown made up the rest of the faith-based organization. The women hail from Tennessee and New York. They work together to spread a message of hope and perseverance to incarcerated men, women, students and free people nationwide. Their stories are of overcoming drug abuse, sexual abuse, death, identity awareness and mental depression. Payne told her father about coming to San Quentin. She said that she urged him to write a letter specifically tailored for the men at the prison. The letter was about the importance of maintaining a relationship with their children while incarcerated. After the letter was read, the packed room of more than 60 men and women, many in tears, gave her a standing ovation. The spiritual women shared some of the most intimate and delicate parts of their lives. Their soliloquies gave the men in blue an honest perspective from a woman’s point of view. Treyontae “December” Hogg expressed inspiration through a song, I Cannot Avoid Myself. “The women from Beauty Behind Bars gave me a vision of how the daughters of incarcerated men feel about their fathers being away,” Hogg said. Dr. McKinney, who is also a minister, delivered her speech, Breaking Free, with enthusiasm. She shared a story about losing many men in her family due to the heroin epidemic and the street life in Brooklyn. “I was protected in Hell and safe in dark places the way my father watched over me,” said McKinney, speaking of her father’s protection over her against similar fates the other men in her family experienced. After listening to McKinney, James Metters, an incarcerated man, said he learned how the women from Beauty Behind Bars saved young girls from making some of the same kind of mistakes they made as young girls. McKinney said she reached out to young girls and shared her story, and she gives all the glory to God for the recovery of her family after a lifetime of struggles and surviving on her own. Her “sister from another mister,” Rhonda Brown, complimented the four members of Beauty Behind Bars on their mission. Brown graced the men with her portion of self-confidence and self-awareness. Her struggles with identity and living the street life affected Mark Stanley-Bey, who identified with Brown’s story. He said her story made him want to donate some of his art to her project, I’m International Ministries. The women spoke at a group, No More Tears, founded by Lonnie Morris about 16 years ago. Morris said that he developed No More Tears to help reduce the tears of families who lost loved ones from acts of violence. “It means no more tears for pain, no more tears for anguish, and no more tears for grief,” Morris said. After the last presentation, No More Tears facilitator, R. “Neffew” Bankston, recited a poem, Shift. The session ended with Love-Harden performing a rap and sharing information to assist men who are up for parole, need shelter and other assistance that may help them when they return to the community.